This comes with a health warning. I have taken the figures from the what you get if you browse the directory and drop down Programming Languages; but the total is only about 37,000, whereas Sourceforge hosts around 324,000 projects. I am not sure what accounts for the discrepancy; it could be that language is not specified for the other projects, or they are dormant, or some other reason. But I hope the proportions indicate something of value. 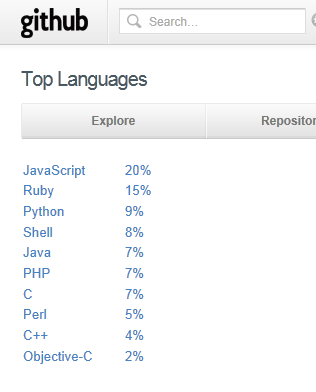 Nevertheless, interesting to see what languages developers on Github are choosing to work with, and perhaps an indicator of what may be most in demand on the job boards a few years from now. Finally, looking at these figures I cannot help thinking how short-sighted Microsoft was in abandoning IronPython and IronRuby back in 2010.